The first thing anyone asks when this model is being described or leveraged is “so what do you get out of it?” This section of our FAQ aims to answer just that by confronting the strategic side of things. In “Incentives,” we will explore reasons why giving half of your work away for free is actually good for business, how pro-bono work can actually attract paid clientele, how the model can help you differentiate your business from others who offer similar services, and how the model can help you feel fulfilled by enabling your business or initiative to create social impact. D1: What are the incentives of this model? Why would I give half of my work away? While the model’s roots are in pure altruism, as time went on, I began to realize the strategic benefits of giving work away for free. These incentives reside in three spaces: personal, educational, and professional. 1. Personal: Let’s face it. The excitement of spending your 9 to 5 creating marketing campaigns that have the sole purpose of helping some big corporation sell a few more bottles of soda wears off quickly. A major incentive of the model, one that is not necessarily measurable, is a contribution to your daily happiness. According to a study by Delivering Happiness At Work, 72% of Americans claim to be unhappy at work. No matter what you do, questions of your own meaning and contributions to the world at large can come about. 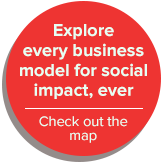 The nice thing about this model is that you are constantly giving back to people that really deserve it, making you an instrumental piece in the puzzle of social impact. 2. Educational: Though it is not often brought up in client conversation, the reality behind helping someone out for free is that you get more creative/intellectual freedom that allows you to challenge yourself immensely. Often times when you are a hired professional you are not challenged. Instead, you are asked to deliver what the client knows you can do perfectly, every time. There is very little room for risky maneuvers, or dipping into completely new territories as a service provider. Pro-bono work, on the other hand, often lends itself well to openness for experimentation and risk. 3. Professional: Something that many people do not realize is that non-profit organizations and do-gooders at large are extremely well connected. These people are blowing up twitter and Facebook, and they have executives from billion dollar companies sitting on their boards. Furthermore, the majority of small non-profit organizations are comprised of a staff that is entirely there on a volunteer basis. This means they all have jobs elsewhere. All of these attributes of small non-profits lend themselves very well to the development of extremely viable and promising networking opportunities. D2: How can I leverage my pro-bono work into attracting paid clientele? As touched upon briefly in D1, non-profit organizations are extremely well connected. There is major opportunity for networking and business development in four avenues: Public Relations, Staff Relationships, Board Relationships, and Karma. in general, tend to have very strong social networking reach due to the attractiveness of the stories they are telling on a day-to-day basis. If you are helping out an organization, and you notice that they have a strong reach, ask them to tweet or Facebook about you here and there. It will result in an entirely new audience for you to be promoted to, and will also directly raise your own following. 2. Staff Relationships: Most small non-profit organizations are comprised of a staff that is 100%, or pretty darn close to 100% volunteer-based. Why does this matter to you? That means they have “day jobs” elsewhere. Get to know the members of the staff that you are engaging with on a personal level. They can become a very valuable basis for referral down the road. 3. Board Relationships: A seat on the “board” of a non-profit organization is a position that attracts a very accomplished demographic, one that is often comprised of business executives in major companies. In many cases, getting access to these kinds of decision makers can be impossible, but by working with a non-profit, you are hands-on with these heavy-hitters. Leverage these relationships for potential referrals as a way to land very large projects. 4. Karma: This is the most obvious reality. If you are doing good things, people will want to support you. This is not something that you can design for. Do good work for good people, and you will be rewarded. D3: How can the pro-bono and paid work influence / enhance each other? Something very interesting about working across two completely different sectors (private + public) is that you are able to cross-pollinate your strategies and methodologies to deliver very valuable and unique advice to each sector. For example, if you are a consultant that is strong with business development in the private sector, you can leverage some of that knowledge to help a non-profit think more like a business. On the flip side, if you have gotten very good at marketing a cause for a non-profit in a very unique manner, perhaps you can leverage those same techniques in the private sector to forge partnerships to create a big impact. D4: What are the long term competitive advantages of this business model? In regards to long term competitive advantages of this model, the primary component is the networking that will occur. As you work for more and more non-profit organizations, and get more and more volunteers involved in your efforts, you will exponentially grow your network. As time goes on, this will only get bigger, not smaller. D5: How can I leverage this model to differentiate my brand from competitors? Much of the success that we have all witnessed in the social enterprise space is the attraction of people and companies that are doing well. While this might be confused for a trend, it is a long lasting competitive advantage, especially when your company is being compared to another similar studio/agency/practice that is offering the same services and quality work as you, but without the social good component. When a potential client is faced with the decision to work with two equally qualified companies, they will choose the one that is contributing to society every time. Take web design, for example. Put yourself in the shoes of the client. If you are looking to spend around $5,000 on a new website for your startup, would you rather give it to a traditional for-profit agency, or would you rather give that money to someone that is going to put it towards good use for society at large? It is a no-brainer! D6: How does this model benefit my whole business? This point in particular is a very unique strategic component to working on projects that you are not getting paid for. The amazing thing about this component of the model’s implications is that you are able to prove the capabilities of your business and more easily enter new segments within your industry do to your ability to prove yourself. The best part: there is no risk. D7: What are the potential profits? The potential profits are only limited by how hard you work, and how strategic you are with overhead. In general, service providers are able to maintain much more profitable businesses in comparison to product-oriented business due to the fact that you really do not need anything more than yourself and a laptop to get started. Over the course of five years, verynice, the company that originated the double-half methodology, has been able to maintain an average profit margin of 65-70%. D8: What is the potential social change? Beyond networking and business development advantages, this model of course offers another incentive, one that is at the core of its intentions: the ability to create social change in this world. This said, it is crucial to understand the extent of your impact. As a service provider that is working with clients, you are able to create impact by supporting the impact of others. Your work is not saving the world. Their work is. It is really important to understand that, and to be OK with that reality. D9: My company is huge, but the in-house department that I work in is pretty small. How can I convince my boss that we should give half? For years, pro-bono has proven to be an incredibly valuable tool within larger companies. Our friends at Taproot have done significant research on this topic as part of their programs for pro-bono program development within corporations. The following are some highlights from their materials. An effective pro-bono program maximizes both business value and social impact; including Increased Community Impact, Human Resources, Reputation, and Innovation. Enable your community partners to expand their own impact by building their capacity to deliver their critical services to the community. Pro-bono programs are great drivers of professional development, increasing employee satisfaction, enhancing recruitment, and creating a more interconnected workplace. These programs help you expand your network, improve brand and public relations and/or strengthen your sustained license to operate.